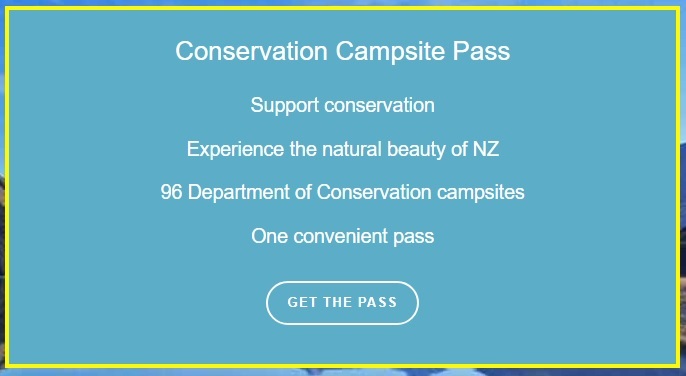 Thanks to Rankers New Zealand we are now also able to provide you with the DOC Campsite Pass which will help you save lots of money on camping fees. Why do I need the pass? Most of New Zealand’s scenic campsites are run by the Department of Conservation (DOC). Whenever you choose to spend the night at one of the 100 campgrounds run by DOC you need to pay a fee of up to $13 per person, per night. Depending on how long you’re travelling for and how big your group is, this can become quite costly. The DOC Campsite Pass only costs you $25 a week per person so you will be able to save hundreds of dollars! Simply follow the link below and fill in your details. Plus you’re contributing to New Zealand’s green image supporting our country’s conservation efforts. When you hire a campervan with Chilli Rentals you can claim your weekly DOC pass by following the link above. You will be prompted to enter your personal details as well as the duration of your holiday. You need to buy a separate pass for each week you are travelling, as each pass is only valid for 7 consecutive nights. Once you have completed the form, the pass will be emailed to you. Simply print it out, fill in your vehicle registration number and place the pass visibly on the dashboard of your vehicle for the DOC rangers to see. The pass is valid on roughly 100 standard and scenic DOC campgrounds as outlined in the DOC guidelines. Once you have purchased the pass you will receive a map showing all DOC campgrounds the pass can be used for. Make sure you read the map thoroughly to avoid unnecessary costs and frustration! Each weekly pass costs $25 per adult and $12.50 per child (age 5 to 17). Infants and children under 5 are free. For example, with the DOC Campsite Pass a family with 2 adults and 2 children over 5 will only have to pay $75 per week when staying at DOC campgrounds. Without the pass the same family might easily have to spend close to $300 a week just for camping. Please note: The campsite pass is ONLY valid if you’re renting a campervan or vehicle from Chilli Rentals! Please note: The DOC Campsite Pass is provided by a third party. Please ensure you read the Terms and Conditions carefully before making a booking, as Chilli Rentals Ltd. is not liable for third party offers. For Freedom Camping we recommend the Rankers Camping App which lists every single campground around New Zealand including price, amenities, pictures and reviews. Some of the DOC Caming grounds may charge an extra fee. Please read the terms and conditions of the DOC Campsite Pass carefully! Get your weekly DOC campsite pass here and save up to 70% on campsite fees.